Large Boats & Yachts - Try our Specialised Charter Services. The larger the boat or yacht the more specialised the shipping service and the fewer options which are available. There are specialised charter services to handle shipping large boats and yachts once they are too large to fit underdeck. 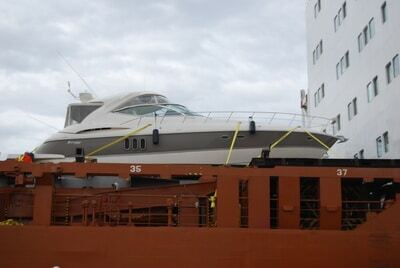 Specialised charter service are not the only way to move large boats and yachts. We also spread large boats and yachts across multiple flatracks on containerships. Some Break Bulk (BBK) vessels have door heights up to 7m. Depending on the location of your boat or yacht will depend on what service is best for you. 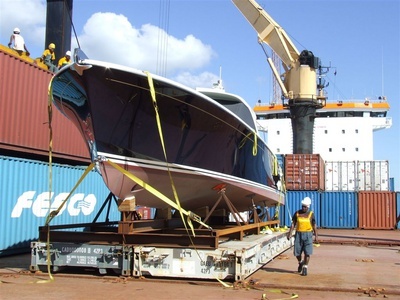 There is allot of varying factors to take into account when shipping a large boat or yacht which is why you need are a freight forwarder that has the experience and knowledge in handling these various methods to ensure you are getting the best advice and service available for your boat or yacht. Boats and yachts with air conditioning require a CFC permit to gain clearance from customs. DAZMAC can arrange your CFC permit application on your behalf. Please ensure you contact us prior to shipping to ensure we have the required information to gain approval for your CFC permit. DAZMAC Marine Logistics can help arrange skippers and deck hands to sail your boat or yachts to and from the loading and discharging ports.